Human action figure Chris Pine unexpectedly crooned his way through much of last night’s pretty delightful Saturday Night Live, but, in the show’s clever take on Hulu’s The Handmaid’s Tale, the current Captain Kirk and Wonder Woman boytoy embodied the plodding, unimaginative root of that dystopia’s evil. As one of a trio of happy-go-lucky bros, Pine’s reveal as the looming male presence who comes upon the sketch’s version of the series’ downtrodden female protagonists might be seen as a relief. After all, these guys aren’t there to subjugate anyone, or force their female acquaintances into a life of forced servitude as brood-mares for the state or anything. 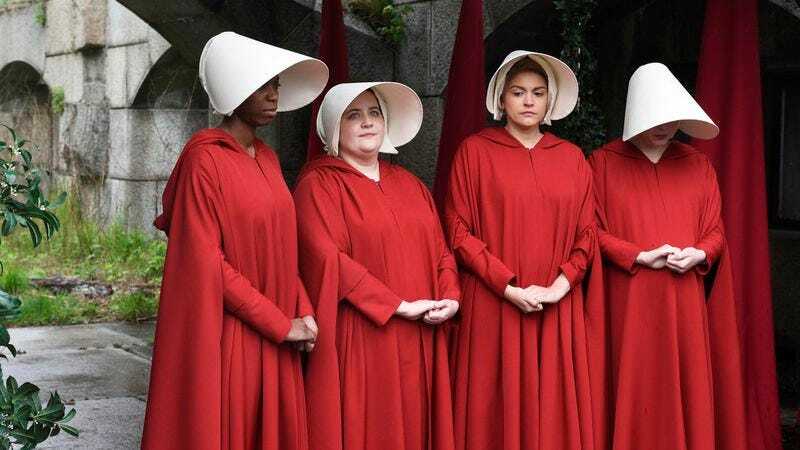 In a real-world America where women’s rights are under serious attack—a fact that makes watching The Handmaid’s Tale all that much more unsettling—the sketch rests on the idea that, while the iron hand of misogynistic dictatorship might bring the hammer down, women really have to worry that their male peers are just going to be too self-absorbed and blithely dismissive to actually care what happens when it does. But don’t worry, as Pine assures the women right before spacey former pal Kyle Mooney’s soldier comes to take the women off to be tortured, his dad’s a lawyer who can totally hook them up. He mainly does entertainment law, but, you know.